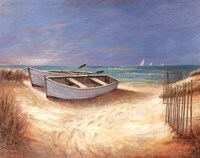 “Ocean Breeze” by Ruane Manning is of a white rowing boat on a sand dune set against an ocean backdrop with a pair of sail boats in the distance. Manning is an American artist born and raised in Philadelphia and currently living in Southern New Jersey. He has won international acclaim for his mostly nature inspired oil paintings. This beautiful painting captures the cool nautical colors of blues and creams. 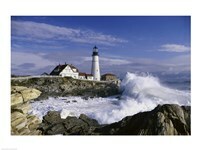 It is the perfect accent piece for any casual beach home living room and will look good framed or finished on canvas.